Charles Mehigan (1860-1939) of Scottish decent married Mary Ann Courtney of Skibbereen (1857 or 1859-1919 or 1921). Charles and Mary had nine children: Mary, Eugene, Timmy, Charlie, Annie married P. Daly, John, Nellie married C. Ford, Jimmy and Kitty married M. Ryan. In the last written version of the Rhubarb Leaf they seem to refer to Mary Ann Courtney as Nanna Magee of Skibbereen who is related to Thomas Davis co-founder of the Young Ireland movement in 1842. There are seemingly no Courtneys in Skibbereen now though. In the future I hope to learn more about the descendant of the Mehigans and in particular Mary’s sister Annie who married John Daly. They had at least four children, Annie and Maureen, John and Kathleen. Their son John who was Jimmy’s (1903) best friend and very nearly his best man (but he went of and broke his leg just before the wedding!). John was also my fathers (Donal) godfather. 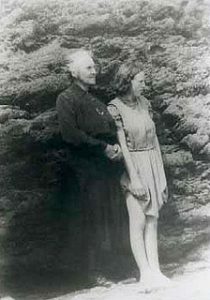 There is also a sister Kathleen who lived on Sherkin Island if she is still alive. Kathleen was a hairdresser in Cork before she married and moved off to Sherkin. She has at least one son. I met her there when I was on holidays about 25 years ago. I was only 13 though and couldn’t figure out the family links at all back then. When I was in Cork on holidays as a child (1970’s) I was onder the impression that Marys youngest brother Jimmy lived their still. He was very old then and we were not allowed to visit him. The house may still though be in the Mehigan family. This has turned out to be incorrect. Marys brother Charlie lived there. He was married (spouse unknown) and had two children, Marion and Junior (Charles). Charles is not married and I’ve heard that he works as a porter at the Regional Hospital in Cork. Part of any research involves looking for documentary proof. In July 2002, while at the National archives of Ireland with my father, we found in the 1911 census records a very good record of the household at 41 Lough Hill. Seven children are recorded in the census. Nine are mentioned as being stil alive. It should be noted though that the daughters Mary who married Daniel Stephen Crowley and Annie who married John Daly are not included in this record. Mary had already started her own family as had in all probability Annie.This would mean that three children died at a young age. A special thanks to my father Donal Stephen and the staff at the National Archives of Ireland for all their assistance. All children born in Cork City.